The approval of the House of Representatives by the Acting President, Prof. Yemi Osinbajo, for fresh $1.28bn and €9m loans under the 2016-2018 External Borrowing (Rolling) Plans of the Federal Government. The letter he wrote was read to the House of Representatives on the matter by the Speaker, Mr. Yakubu Dogara, on Tuesday in Abuja. Osinbajo explained that the $1.28bn was to support the operations of the Development Bank of Nigeria. He said the “multi-donor supported bank” was approved during the administration of former President Goodluck Jonathan and had its financial agreements executed on February 25, 2015. However, the acting President stated that the $1.28bn, which ought to have been included in the 2014-2016 borrowing plans, was inadvertently omitted. He noted that there was an urgency to re-list the $1.28bn in the 2016-2018 borrowing plans because the creditors were ready to provide the funding. For instance, Osinbajo said the World Bank Group would provide $500m; African Development Bank, $450m; Kfw Development of Germany, $200m; and French Development Agency, $130m, bringing the total to $1.28bn. The letter added that the €9m would go into the Fund for Agricultural Finance in Nigeria. 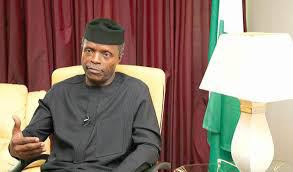 Osinbajo stated that the Kfw Development Bank of Germany would provide the money. He stated, “The first phase (FAFIN-I) was in the €10.5m and the financing agreement was executed on the 3rd of October, 2013. It is an investment facility in agricultural financing. The first tranche of FAFIN-I has been fully disbursed and the donor is ready to provide another tranche of €9m for FAFIN-II. Earlier on April 26, 2017, President Muhammadu Buhari had written the National Assembly seeking approval to include another $6.9bn in the borrowing plans. The facility was requested for the execution of key rail projects, the rehabilitation of the North-East and projects in education, agriculture and health sectors. According to the President’s request, the Chinese, through the China Eximbank, will provide over $5.8bn of the loan, while the World Bank will make provisions for the balance. Among the rail projects are the Coastal Railway Project (Lagos-Calabar segment), estimated at $3.4bn; the Lagos-Kano Railway Modernisation Project (Lagos-Ibadan segment), $1.2bn; and the Lagos-Kano Railway Modernisation Project (Kano-Kaduna segment), $1.1bn.